About one year ago, Peter Head posted a brave defence of Red Letter Bibles. In effect, Jesus said hearing and doing ‘these words of mine’ are foundational to the faithful life; allegiance to ‘me and my words’ is announced as a criteria for judgement (Mark 8.38; Luke 9.26). His words are eternal (Matt 24.35; Mark 13.31; Luke 21.33). He is the Word of God, his own words come directly from God, and so the one who loves Jesus will pay special attention to his words (e.g. John 14.23f), abiding in Jesus involves abiding in his words (John 15.7). The evangelists themselves place special emphasis on Jesus words with the result that the synoptic evangelists agree much more closely in the wording of the words of Jesus than in the narratives which surround those words. Paul too seemed to place special importance in Jesus words as basis for Christian instruction (see e.g., 1 Cor 7.10; 9.14; 11.23ff; cf. instruction not based on Jesus’ words in 1 Cor 7.12, 25). 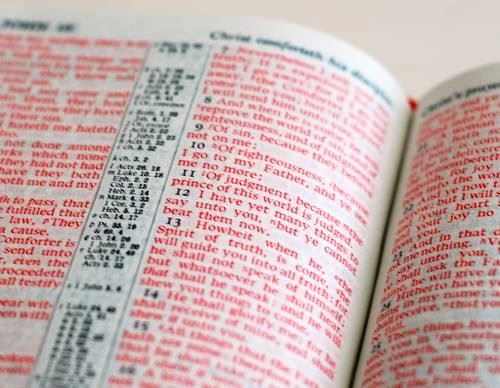 He also pointed out that the red ink was originally intended to connect the words of Jesus with the plot line of Jesus’ redeeming death: a symbolism of Christ’s blood. Anyway, I was reminded of this today when I read a post at The Eagle and Child who pointed out that two books isolating the words of Jesus have been published recently: The Words of Jesus: A Gospel of the Sayings of Our Lord with Reflections by Phyllis Tickle and The Red Letters: The Sayings and Teachings of Jesus by Timothy J. Beals. A groundbreaking book that presents Jesus’ own words from the Gospels, topically arranged but without any commentary, so that people may hear his message in his terms. While the entire Gospel narrative is essential to Christian theology, Jesus’ own words distinctively teach us how to live and how faith makes a difference in one’s life. The Red Letters gives a clear overview of Christianity’s foundational message in a unique way: allowing Jesus to speak for himself, without any human commentary. This groundbreaking book simply includes all of Jesus’ words from the Gospels, arranged by topic and rendered in the ESV translation. Jesus’ own words. Nothing more, nothing less. For everyone who would like to rediscover the heart of Christianity—or perhaps discover it for the first time—as Jesus Christ himself communicated it. It is sometimes difficult to determine where Jesus’ words begin and end, e.g., John 3:16 (is it still Jesus speaking? ; TNIV does not include v 16 as part of Jesus’ words). The red print is distracting. I think it is a hard call, there are good arguments for and against, but in the end, I think I prefer my black letter Novum Testamentum. I have always liked the red words. But I thought if Jesus' words get to be red, shouldn't God's words be blue or something? Have you seen the Green Bible? All the nature-related passages are in green text. The use of red ink get complicated in the Apocalypse, however. 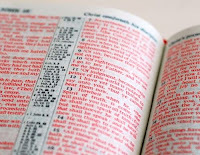 Will you highlight only direct words of Christ or also those of God the Father? If the former, will it not lead one to give Jesus' words in the apocalyptic narrative a higher value than to those of the Father (who does a fair amount of speaking therein, to say the least)? If the latter, one falls into inconsistency for the words of the Father are not in red (as far as I know) in the Gospels. Any thoughts on that? I prepared an entire Greek New Testament with red letters for Christ, blue for the Father and green for the Spirit. Unfortunetely it is only on my pc: found noone brave enough to publish it. I also assisted in the preparation of a blue letter edition, published by Jongbloed NL (http://www.oneway.nl/n/filmisch-bijbellezen-met-blauwe-letters/25653/index.html) with anything God said in direct speech, that is) in blue. Believe me, I had a great time! I don't think a separated printing of Jesus' words is a particularly good idea and it is striking that Christians have so consistently resisted the temptation to do so (Q may have been useful, but it was not a genre considered worth preserving). It is either naive or deceitful to think that a topical arrangement lacks any human commentary. The human who selects the sayings and creates the topical arrangement has already imposed a kind of commentary. My question is an obvious one. Are the words spoken by Paul under the inspiration of the Holy Spirit any less than the words spoken by Jesus? Why think in terms of less and more? Direct speech is different from indirect speach, and it is very revealing to ask the question: why is this direct speech? Very often it is because it is important to report not only what is said, but also how it was phrased. Gie—I think it's interesting that you chose blue for the Father (as I would have). I like that color because of blue feels like a "pure" color to me, and reminds me of the Heavens, which is God's abode. But why green for the Holy Spirit? Maybe His words should be invisible like He is most of the time. As a matter of fact I picked yellow for the Spirit (like the rays of the son), but that was not visible enough, so I made it green, the color of new life and of hope. Don't take my choices so serious. Yes, I can see how yellow could be tough to see (though not as bad as white — because of the dove imageriy). No worries, I'm not taking it too seriously at all. I often wonder about the distinction between substantial discourse and incidental discourse (I just made those terms up right now). So I walked into the tim hortons and asked the girl for a large coffee, and that's when she explained that they were giving away apple fritters for free! Can you believe it! So I walked into the tim hortons and asked the girl "excuse me, may I have a large coffee please?" That's when she said "we're giving away apple fritters for free! Would you like one?" I could not believe it! Obviously in the first example I've simply given an indirect description of the narrative, while in the second I've incorporated direct discourse. But how substantial is that discourse? It's not really important to the story to have the tim hortons girl actually say those words -- as example 1 shows, their sense could just as easily be embedded in the narrative itself. Those words really don't tell me anything about her, they are just functional words meant to move the story along; it's only incidental that they are words in her mouth, and yet if I was making a "brown letter edition" (coffee coloured, that is) those words would end up in brown. How helpful is that? In the same way, I might be able to see the value of some of Peter's (Head, not apostle) arguments in regards to substantial sayings of Jesus, e.g. Luke 23:34 "father forgive them for they do not know what they are doing" but how is it helpful to print in red Luke 24:19 "And he said to them 'what things?' And they said to him 'the things about...'"
The characters addressing us in dirct speach get more lively, for one. No colors please. What if we used certain colors for commands, another for good ideas, and others for simply contextual "fluff." Maybe another color for "no longer applicable." Sub-categories are too interpretive to be endorsed with colored ink. I think in relation to Ryan's comment that this is a narrative choice, and we can see different approaches to this even in the synoptic parallels. A red letter edition brings this choice to the forefront. Personally I think Eagle and CHild's second point against is the strongest - an editorial mis-step amounts to nothing less than misquoting Christ and altering the narrative of his life. However, one can make this same argument against quotation marks, and push it further to commas and periods (did Jesus really take a breath there?). Personally, I like colored ink and a full inventory of punctuation. Gie's work with three colors sounds like something I've hoped to see for a while. Pease keep in mind that nobody argues that Jesus words in every edition of the Bible should be coloured. I like red letter editions, but use the 'normal' editions (much) more often. And I like to compare RL-editions, as they make different decisions. Good point Gie, it is not either or. If the goal is just the publishing (printing part) http://www.lulu.com is a potential option. I do use a red-letter ESV, but only because it was the only edition I could find with cross-references and a reasonably resilient binding. Given the choice, I wouldn't want a red-letter edition simply because of the ambiguity of what is and isn't direct speech of Jesus. For a start, most of what is recorded in the NT was probably originally spoken in Aramaic, and translated (fairly freely in some cases) by the gospel writers into Greek, which suggests to me that the actual words themselves are not more important than the material surrounding them. It's also hard to know where direct speech ends, John 3:16 being a good example. in addition it is hard to know whether apparent direct speech is direct after all in some instances: markers of direct speech like ὁτι can also be used to introduce indirect speech "he said that ..." rather than "he said: ..."
Twenty-three New Manuscripts in Athens! New Greek Manuscript of Revelation!